Did you know that Lemon Tree Hotels (LTH) is one of the fastest growing hospitality chains in India with seven hotels in Delhi NCR alone? 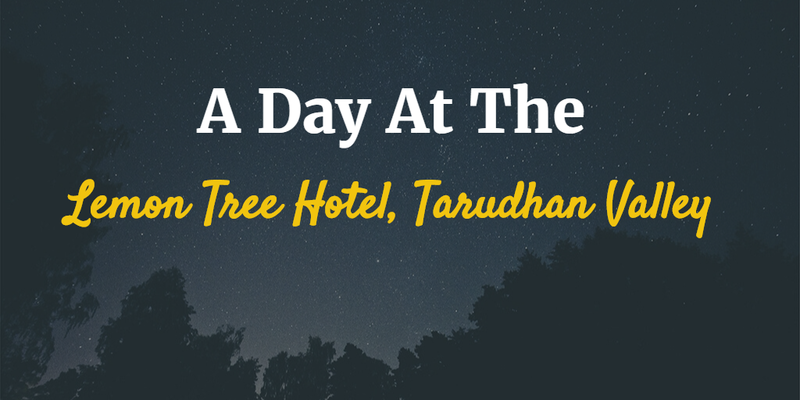 Yours truly was invited recently to review their first resort hotel in Tarudhan Valley, Manesar. In this blog post, I am going to share my experience of how it felt to be at the new resort hotel. First things first! Nestled in the heart of the Aravalis, the new resort hotel offers absolutely breathtaking views of the beautiful landscape, encompassing picturesque greens and serene water bodies. Branded as the Lemon Tree Hotel, Tarudhan Valley, this one of a kind property seems like a perfect getaway for all seasons. Reaching the resort hotel might seem like a tall order at first (particularly to first-timers traveling this side), but is actually a stone's throw away from the immensely popular ITC Grand Bharat in Manesar. Mere 40-minutes’ drive by car from the Ambience Mall Gurgaon or 25-minutes from the IFFCO Chowk is what it takes to reach this classy, sprawling retreat spread across 72 acres. The resort hotel also envelops a 9-Hole Golf Course designed by one of the best golf course architects in North America, Graham Cooke. Developed and owned by the Silverglades* group, the resort hotel is managed by the Carnation Hotels, the hotel management joint venture partner of LTH. Designed to meet the expectations of all age groups, this landscaped getaway offers 70 contemporary, well-appointed rooms, including 12 executive, 40 deluxe, and 18 studio apartments with an awe-inspiring view of the golf course. If you are a corporate or a wedding planner, the resort hotel also provides an exclusive Banquets Arena with three large conference rooms and manicured gardens that are equipped to host a variety of events, destination weddings, and conferences. So what are you waiting for? Come, wake up to the sweet fragrance of Frangipani or Plumeria flowers, while experiencing the best hospitality and food and beverages that Tarudhan has to offer.